A new arcade game has been released which does away with any controllers – all you need is a pair of eyes to play. Kinect may have taken the world by storm when it comes to hands-free game controlling but Tobii has decided to go one further and release EyeAsteroids, a game controlled by a person's eye movements. This is all done by something called 'gaze interaction' which is said to beat hand gestures when it comes to latency. 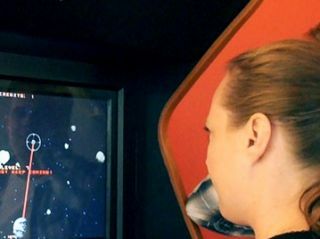 Speaking about the new arcade game, Henrik Eskilsson, chief executive officer of Tobii Technology, said: "We believe the addition of eye control to computer games is the most significant evolution point in the gaming industry since the introduction of motion control systems, such as the Nintendo Wii. "Gaze interaction is fast and intuitive, adding an entirely new dimension to video game interaction. Players are now able to immerse themselves into a game like never before, taking competition to a completely new level." If you want to eye up EyeAsteroids, the game will be doing a world tour beginning this week. It starts off in New York City at Dave & Buster's Time Square and will come to London before November is out. If you fancy purchasing the arcade game, then you will have to fork out an eye-bleeding $15,000 – but you will be safe in the knowledge that only 50 units are being made.